Win A Classic Truck In 2018! The Atlas Pro™ Plus program is designed to help you build your business, brand and bottom line by giving you access to tools and resources that can showcase your expertise, increase your visibility, and help you close more jobs. Plus, the latest additions to the Atlas Pro Plus program make it easier than ever to earn rewards for the thousands of Atlas shingle systems you install throughout the year. It all starts with a FREE Atlas Pro account. Here, you can access Atlas business-building tools and resources such as training videos, literature, sample boards and marketing materials. You can also purchase discounted EagleView reports, learn about customer financing resources and more! Once your account is set up, every registered and installed Atlas shingle square or Signature Select® Roofing System moves you one step closer to earning Pro Plus Silver, Gold and Platinum status. 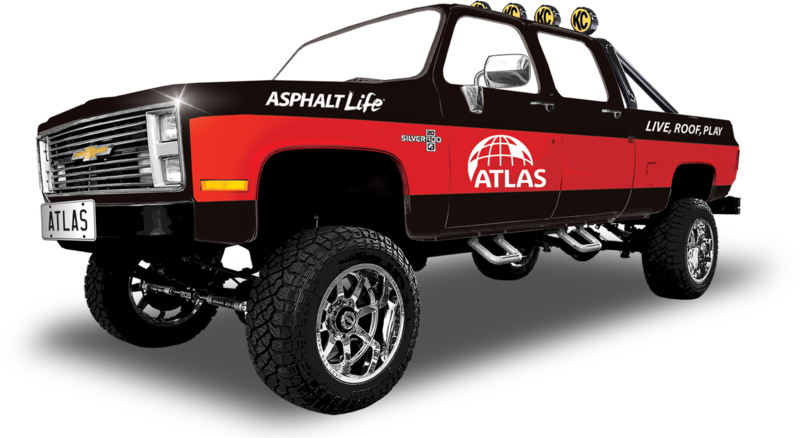 This year, Atlas has upped the ante and is giving away $2,000 worth of Asphalt Life prizes each month through weekly random drawings starting June 30. Even better, one lucky winner will drive away with the grand prize — an Asphalt Life-themed classic pickup truck! The 1951 Chevrolet 3100 is painted in factory Swift Red and features a highly sought-after five-window cab, whitewall tires with a side-mount spare, all of the optional chrome and stainless trim, and a solid steel frame. Plus, this beauty’s fully rebuilt engine purrs like new. Once you opt in for the sweepstakes, points will be credited retroactively from Jan. 1 and will continue to accrue through 5 p.m. ET on Dec. 31. The more points you earn, the more chances you have to win! In January 2019, 10 contractors will be selected by random drawing as part of the truck sweepstakes to receive a free trip to the IRE in Nashville, TN, where one lucky winner will claim the truck. Check out all of the official sweepstakes rules at AtlasRoofing.com/truck-givaway. As a member of the Atlas Pro community, you can use your account to view and manage your jobs, register homeowner warranties, get free leads, update your company profile and build a database of testimonials. Your Pro Plus account can help you enhance your online presence with the Atlas Web Injector, which allows you to insert Atlas product pages and design tools onto your company’s website. As a Pro contractor, you’ll be able to download Atlas logos and photos and shop our online store for literature, sample boards, co-branded items and jobsite gear. “I could install any shingle manufacturer’s products, but my top choice is Atlas because it’s a quality company that really knows how to construct a roofing shingle properly,” says Mark Franz, president of Armadillo Roofing and Exteriors in Melbourne, FL. Franz, an Atlas Pro contractor for nearly 14 years, says the program creates a good partnership for everything from technical questions to assistance with possible warranty claims. “Plus, I like the extra support and attention I get from my representative and Atlas in general,” he adds. Zach Wilkerson, one of the owners of J Key Roofing in Walton County, GA, enjoys the value his Platinum-level Pro Plus account adds to his business. Your Atlas Pro Plus account also allows you to manage your rewards and payouts. Annual achievements are split into three levels — Silver, Gold and Platinum. When you achieve Silver-level status, you will be rewarded with a variety of great prizes, from EagleView credits to co-op collateral. As you progress to Gold and Platinum levels, the rewards continue to get better — from coolers and Visa gift cards to drones and iPads. The harder you work, the faster you’ll move up within the rewards program. Reap the rewards of your hard work and take advantage of everything the Atlas Pro Plus program has to offer. Register on the Atlas Pro website, which is free and easy to do. Log into your Atlas Pro account to submit your completed jobs and corresponding warranties via the “My Jobs” form. Once approved, your account will be updated to reflect your total number of Atlas shingle squares and Signature Select Roofing System installations. You will always know exactly how many installations you have completed and how many more you need to reach the next reward level. To view a complete list of rewards and for additional information about the program, visit AtlasRoofing.com/pro.